John Gilbert Baker (13 January 1834 – 16 August 1920) was an English botanist. Baker was born in Guisborough, the son of John and Mary (nêe Gilbert) Baker and educated at Quaker schools in Ackworth and York. He worked at the library and herbarium of Royal Botanic Gardens, Kew between 1866 and 1899, and was keeper of the herbarium from 1890 to 1899. He wrote handbooks on many plant groups, including Amaryllidaceae, Bromeliaceae, Iridaceae, Liliaceae, and ferns. His published works include Flora of Mauritius and the Seychelles (1877) and Handbook of the Irideae (1892). Baker, J. G., (1871), Monograph of the Genus Xiphion, Journal of Botany (London) 9: pages 9-14, 41-43, and 108-110, plate 169, Iris palaestina. Baker, J. G., (1871), Journal of the Linnean Society, vol. xvi. P. 123. Iris tingitanum. Baker, J. G., (1875), On A New Xiphion From The Punjaub, Journal of Botany, vol. 13, p. 108. Iris aitchisonii. Baker, J. G. (1876), A Synopsis of the Known Species of Iris -I., Gardeners' Chronicles I. 526-527..
Baker, J. G. (1876), A Synopsis of the Known Species of Iris -II., Gardeners' Chronicles I. 559. Baker, J. G. (1876), A Synopsis of the Known Species of Iris -III., Gardeners' Chronicles I. 623-624..
Baker, J. G. (1876), A Synopsis of the Known Species of Iris -IV., Gardeners' Chronicles I. 692. Baker, J. G. (1876), A Synopsis of the Known Species of Iris -V., Gardeners' Chronicles I. 723..
Baker, J. G. (1876), A Synopsis of the Known Species of Iris -VII., Gardeners' Chronicles II. 36-38. Baker, J. G. (1876), A Synopsis of the Known Species of Iris -VIII., Gardeners' Chronicles II. 143-144. Baker, J. G. (1876), A Synopsis of the Known Species of Iris -VII., Gardeners' Chronicles II. 226. Baker, J. G. (1876), A Synopsis of the Known Species of Iris -VIII., Gardeners' Chronicles II. 323. Baker, J. G. (1876), A Synopsis of the Known Species of Iris -IX., Gardeners' Chronicles II. 517-518. Baker, J. G. (1876), A Synopsis of the Known Species of Iris -XI., Gardeners' Chronicles II. 647-648. 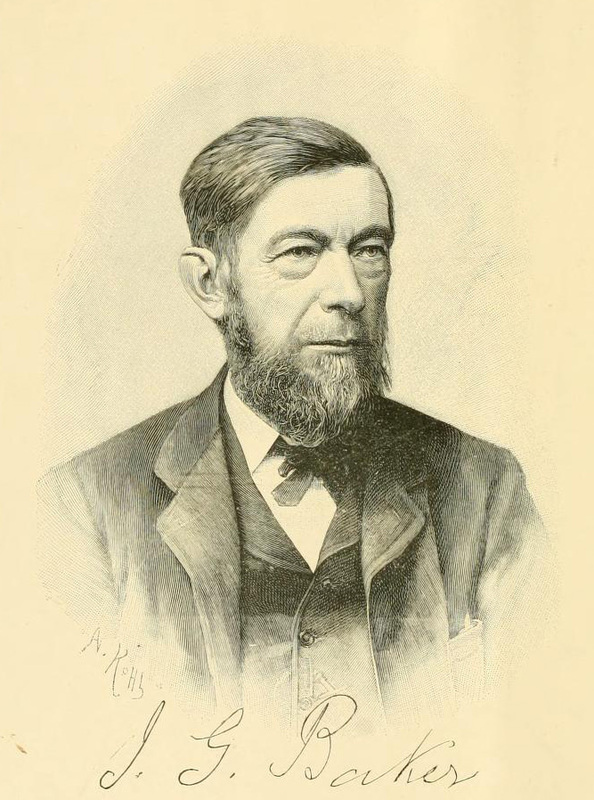 Baker, J. G. (1876), A Synopsis of the Known Species of Iris -XII., Gardeners' Chronicles II. 706. Baker, J. G. (1876), A Synopsis of the Known Species of Iris -XIII., Gardeners' Chronicles II. 740. Baker, J. G. (1876), A Synopsis of the Known Species of Iris -XV., Gardeners' Chronicles II. 774. Baker, J. G. (1876), A Synopsis of the Known Species of Iris -XVI., Gardeners' Chronicles II. 806. Baker, J. G. (1877), "Iris Speculatrix", in Curtis's Botanical Magazine, Tab. 6306., 1877. Baker, J. G. (1877), Journal of the Linnean Society of Botany, 14: p. 138. Iris hartwegii. Baker, J. G. (1877), Journal of the Linnean Society of Botany, 16: 108. Xiphion aitchisonii var. chrysantha. Baker, J. G. (1878a), "Iris Cretensis", in Curtis's Botanical Magazine, tab. 6343., vol. 1878. Baker, J. G. (1878b), "Xiphion Planifolium". in Curtis's Botanical Magazine, tab.6352., vol. 34 in 3rd series or 104 in main work, 1878. Baker, J. G. (1878c), "Systema Iridacearum", in Linnean Journal of Botany, vol. 16. p.61-148+. Baker, J. G. (1878d), "New Garden Plants", Iris Balkana, Janka. Gardeners' Chronicle, p. 266. August 31. Baker, J. G. (1879), Iris Dichotoma in Curtis's Botanical Magazine, Tab. 6428. 1879. Baker, J. G. (1881), Iris Missouriensis in Curtis's Botanical Magazine, Tab. 6579. Sept. 1st. 1881. Baker, J. G. (1884), "Iris (Xiphion) Tingitana". in Curtis's Botanical Magazine, Tab. 6775. Sept. 1st. 1884. Baker, J. G. (1886), Iris Bartoni in Curtis's Botanical Magazine, Tab. 6869. April 1st. 1886. Baker, J. G. (1886), Iris Milesii in Curtis's Botanical Magazine, Tab. 6889. August 1st. 1886. Baker, J. G. (1886), "Iris Statellae'. Curtis's Botanical Magazine, Tab. 6894. Sept. 1st. 1886. Baker, J. G. (1886), "Iris Eulefeldi". Curtis's Botanical Magazine, Tab. 6902. October 1st. 1886. Baker, J. G. (1887), "Iris (Xiphion) Vartani". Curtis's Botanical Magazine, Tab. 6942. June 1st. 1887. Baker, J. G. (1887), "Iris Kingiana". Curtis's Botanical Magazine, Tab. 6957. September 1st. 1887. Baker, J. G. (1888), "Iris Alberti". Curtis's Botanical Magazine, Tab. 7020. 1888. Baker, J. G. (1888), "Iris Korolkowi", Curtis's Botanical Magazine, Tab. 7025. Nov. 1 st., 1888. Baker, J. G. (1888), "Iris Suwarowi", Curtis's Botanical Magazine, Tab. 7029. December 1st. 1888. Baker, J. G. (1889), "Iris Meda", Curtis's Botanical Magazine, Tab. 7040. February 1st. 1889. Baker, J. G. (1889), "Iris Barnumae", Curtis's Botanical Magazine, Tab. 7050. April 1st. 1889. Baker, J. G. (1889), "Iris Paradoxa", Curtis's Botanical Magazine, Tab. 7081. Oct. 1st. 1889. Baker, J. G. (1889), Iris atropurpurea Gardeners' Chronicles vol. 1: p330. Baker, J. G. (1890), "Iris (Xiphion) Boissieri". Curtis's Botanical Magazine, Tab. 7097. January 1st. 1890. Baker, J. G. (1890), "Iris (Juno) Rosenbachiana", Curtis's Botanical Magazine. Tab. 7135. September. 1st. 1890. Baker, J. G. (1890), "Iris Sindjarensis", Curtis's Botanical Magazine, Tab. 7145. November 1st. 1890. Baker, J. G. (1892), "Iris Fosteriana", Curtis's Botanical Magazine, Tab. 7215. January 1st. 1892. Baker, J. G. (1892), "Iris Lortetii", Curtis's Botanical Magazine, Tab. 7251. August 1st. 1892. Baker, J. G. (1892), Handbook of the Irideae. G. Bell & Sons, London. 247p. Baker, J. G. (1893), "Iris Hookeriana", Curtis's Botanical Magazine, Tab. 7276. January 1st. 1893. Baker J. G., (1893), "New or Noteworthy Plants", in Gardeners' Chronicle. 1: 384. April 1 I. atrofusca. Baker, J. G., (1894), "Iris Atropurpurea, var. Atrofusca". Curtis's Botanical Magazine, tab. 7379. 1894. Baker, J. G., (1896), "Iris Albopurpurea", Curtis's Botanical Magazine, Tab. 7511. December 1st. 1896. Baker, J. G., (1898), "Iris Grant-Duffii", Curtis's Botanical Magazine, Tab. 7604. July 1st. 1898. Baker, J. G. (1900), "Iris Obtusifolia", Curtis's Botanical Magazine, Tab. 7701. February 1st. 1900. Baker, J. G. (1901), "Iris Chrysantha". Curtis's Botanical Magazine, Tab. 7784. July 1st 1901. Baker, J. G. (1903), "Iris Lupina". Curtis's Botanical Magazine, tab. 7904. 1903. Baker, J. G. & M. Foster, (1888), Irises, The Gardeners' Chronicle, p.182-183, August 18, 1888. (sp. nova; I. cypriana and I. barnumi).